thursday tales Go Away my love!! Life was taken aback as my loved ones left me. I met you at a time when I desperately wanted to live life. It was a blissful moment everytime I lived with you. You never made me feel miss home. But today you said it was all over. All over for me and all over for you. I'm not hurt or sorry but I am confident enough that I don't need you anymore.I can fend for myself without anyones help.You think I shall be flummoxed and give up. Why do you have to hurt me and leave me with all those scars?. Wouldn't you love me anymore?. With pain and tears on my eyes I reminisce about the happy moments with you. I'm hurt,I'm sad, I'm jinxed. You stole my love by giving me the yellow balloon. 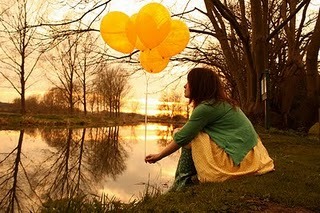 Today that you have gone, I'm releasing this balloon from my life. Go away my love, go away balloon. Life has made me strong enough that I can fend for myself. intense emotions very beautifully woven in words and fantastically expressed !! Brilliant ending, Steph..! Liked it! Btw, get back to the black :P TSW and white don't make a good combination..!